You're here: Home » 7 Things You Thought You Knew About Content Marketing Were Wrong! I know you’ve heard a lot about how content marketing drives SEO, but get ready to change everything you thought you knew about content marketing — this will knock your socks off! Your content marketing is WRONG! OK, so you never heard about content marketing before last year. That’s not surprising. Why the “sudden” interest in content marketing? The answer is SEARCH! You have Google (which accounts for 70% of search) trying to keep users by promising the best search results. You have businesses who survive or fail based on SERPs. Before last year, even big, respectable brands gamed the system using Google’s algorithm to improve their SERPs because it was frankly cheaper and easier to do that. Google, like a stern mother trying to get acceptable behavior from her wayward child, tweaked the algorithm — first with Panda, then Penguin — which banished the worst offenders to Siberia, Google-style. Gone were keyword stuffing, paid backlinks, buying Facebook Fans, and other games to get found online. Enter Hummingbird — notice Google’s love for popular animals in naming its major updates. Hummingbird was effectively the last nail in the coffin and left brands with little choice but to focus on providing valuable content. Content marketing is really the new SEO because it drives all 5 factors plus many of the other 200 or so factors making up the latest Google search algorithm. Content marketing is not only changing SEO strategy, it’s changing the very nature of digital marketing and social media marketing strategy. If you’re not developing and implementing a strong content marketing strategy, get ready for obscurity. When I first started this site nearly 3 years ago, my mentor told me lots of things I was doing were wrong. I should use my keywords more in creating content, I should use lots of color in creating my posts, and I shouldn’t worry about what I said, as long as I put up a lot of content. Luckily for me, I didn’t listen to my mentor beyond his technical advice because soon the world of internet search changed dramatically and my content was poised to take off — which it has thanks in no small part to my core of readers who help share my content. So, let’s explore the myths and realities of content marketing since everything you thought you knew about content marketing was wrong. Backlinks come when another site references your site or page. Initially Google loved backlinks because they were a shorthand to your authority, since other sites aren’t going to refer to your content if it’s crap — technical word there, I hope I didn’t lose you. 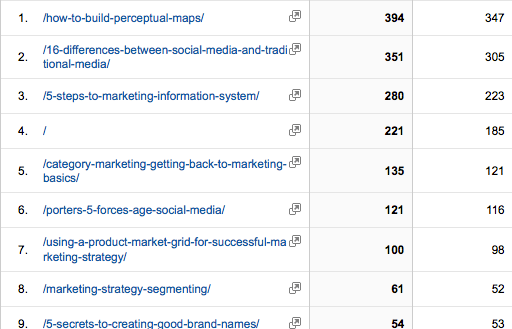 Marketers knew they could improve SERPs if they got backlinks. But getting backlinks is hard. So, they started gaming the system — commenting on lots of sites, embedding links in duplicate content sent all over the web in the form of guest posts, buying backlinks to authoritative sites, and other low tricks. Google asked businesses to stop. Google warned businesses to stop. Google began penalizing businesses who bought and sold backlinks. Finally, since nothing is working, Google is making noises that they’ll STOP using backlinks as heavily in their algorithm. And, leading SEO firms like Moz, Search Engine Watch, and Search Engine Land, are starting to take notice. Instead, I’m hearing recommendations to improve your OUTBOUND links. The notion is that content referring to authoritative sources is likely better because it’s better researched. This is really the academic model where we’re concerned a paper used the right sources in building a theory. My friend Peter at SocialEars recommends 5 outbound links to high pagerank, relevant sites for each post. My guess is he has some data to back him up as he’s a real data-driven kind of guy. No, better content is better. Answer questions and solve problems — that’s good content. Self-promotion is bad content. That said, data suggests 2-3 posts a week is great for conversion. Add more posts and your conversion rate goes up a little, add less content and your conversion goes down dramatically. So, focus on generating 2-3 HIGH quality posts a week based on a deep understanding of your target audience. This myth is based on the notion that visitors have short attention spans, so you want your content to be short and pithy. Even I was shocked by recent data showing content over 2400 words gets significantly more shares and shows up higher in SERPs than shorter content. The key with larger posts is to make the content chunkable — meaning you break up content into short paragraphs and use headings and subheadings liberally throughout the post. Adding images also enhances the return on content and makes it more readable. Wow, has using keywords changed over the last 3 years. At first, keywords were simply that: key WORDs. A single word or maybe 2. Now, long-tailed keywords are the secret sauce for getting found online. You get the idea — long. Using long-tailed keywords reduces competition and ensures visitors find what they’re looking for on your sites. Time on site and low bounce rate have the bonus of improving your SERPs. Don’t get me wrong. We’re a data-driving digital agency so the last thing I’ll tell you to do is ignore your analytics. But, Google recently increased the number of “not provided” keywords, which means you’re playing in the dark when it comes to figuring out which keywords are working. Luckily, Webmaster Tools, also by Google, has taken up the slack. Webmaster Tools were always a good idea, but now they’re really necessary to run an effective content marketing strategy. Not only are more keywords available in Webmaster Tools, but submitting your site map helps ensure your content gets crawled — the first step toward getting found on Google. Just a few months ago, you’d hear lots of smart SEO and social media marketing folks advising you create new content using analytics showing which of your past content worked well. And, that still works. Check out which posts really resonate well with your target audience (get the most views, shares, comments) and create more content on that topic. Google is moving toward semantic reasoning for search — trying to gauge your intent when you search — to deliver superior results. Google has tools that more effectively detect duplicate content, which is the kiss of death for SEO. Hence, using an old popular post and just tweaking it a little may mean you create duplicate content in Google’s eyes. You need to think more broadly about how to use analytics to help create new posts that resonate with your target audience. Now, I could create new posts about perceptual mapping or differences between traditional and social media, since these were popular posts, but that assumes there’s something NEW to say about these topics. Just rehashing what was already said might be viewed as duplicate content. Yes, good content WILL drive traffic, but it needs some help! Thinking that good content is enough to drive your content marketing strategy and bring heaps of visitors to your site is naive. You also need a sound social media marketing strategy to ensure your great content doesn’t lie buried under a rock. There’s really not enough space to provide guidance on developing a sound social media marketing strategy here, but you’ll find lots of great info in other posts on this site — use the category: social media marketing strategy. You should also grab our ebook on how to make money online for an overview and tools for developing a sound social media marketing strategy. In general, you want to create a presence on several social media platforms. Depending on your brand, you might use Facebook, Twitter, LinkedIN, Google+, Pinterest, Vine, Snapchat …. There are hundreds of available platforms, so choose the ones where your target audience hangs out. Creating a social presence means engaging, not just sharing on these platforms. Share your content across these platforms and don’t forget Google+. You’ll find “experts” who poo-poo this platform (although you find this has lessened over time), but don’t listen. Google+ has GOOGLE in the name, so it’s dangerous to ignore them. Plus, studies suggest posting content on Google+ helps get your pages indexed faster and show up better in SERPs based on +1s (Google+’s version of a Facebook like) and other forms of engagement on the platform. Definitely grab my FREE ebook on content marketing strategy. Whether you need a complete analytics strategy, some help with brand marketing, or some consulting to optimize your existing social media marketing, we can fill your digital marketing funnel. We can help you do your own social media marketing better or do it for you with our community managers, strategists, and account executives. You can request a FREE introductory meeting or sign up for my email newsletter to learn more about social media marketing.